Opportunities are available for individuals and groups (up to 26 people) to serve through short term ministry projects. These opportunities range from children’s ministry to home renovation. To find out about more opportunities available please read through the Mission Team Information Packet below or download the packet and print it out. If you have any questions or need additional information, please contact John Morris, john.morris [at] gapky.org. Start by checking our calendar to see what dates are available. Then a telephone call or email to GAP can tentatively reserve that space. The Mission Team Application form and deposit must be received by GAP to officially reserve a week. Once we have received your deposit, a confirmation email will be sent to you. Make all checks payable to GAP, Inc. Please understand that all the weeks are reserved on a first come first serve basis. Please delegate one person to be the contact person and to take care of all the financial dealings with GAP. To help us, please designate on your check the name of the group and the dates you will be serving with us. If you must cancel, GAP will refund your deposit, if that week can be filled by another team. Every person in your group must complete an Assumption of Risk Agreement and Release/Media Release Form before they can stay/ work at GAP facilities or participate in GAP sponsored project. You may bring the completed forms and submit them when you arrive on your trip. Adults, as well as youth groups are encouraged to volunteer with GAP. We require that you bring no one younger than 12 years and that you bring a minimum of one adult (21 years or older) for every five youth on the team. SERVANT’S HEART LODGE, GAP’s mission team housing, was built in 2006 by various mission teams. The Lodge is centrally located and can accommodate twenty-six (26) individuals. On the first floor, you will find three bedrooms with three twin bunks each and a fourth handicap accessible bedroom that has one twin bunk as well as a full bunk (bed linens are NOT provided). Each room has a private bath, which consists of shower, toilet, and double sink. A full kitchen and eating area is provided. The kitchen is stocked with pots/pans, flatware, cooking utensils, dishes, hand towels, and various cooking appliances. There is also a outdoor gas grill available for you to use. A large open room awaits you upstairs which can be used as a sitting area or game room. There is a half bath and 2 twin beds upstairs as well. The Lodge has central heat and air, dishwasher, and a washer and dryer. There is a storage building on site to store tools for construction teams. Cost: $300 Deposit to reserve; $115.00 per person. Teams staying for one week (Sunday – Friday) will receive a T-shirt and a choice of either a dessert fellowship or nothing at all on Thursday night. No pets are permitted. PARTNER’S PLACE is a 3 bedroom/2bath double wide trailer. It is located on the hill just above the Distribution Center. It has two full size beds, fully stocked kitchen, a dining room and living room with a sectional couch. It has central heat and air, dishwasher, and a washer and dryer. (Dishwasher and washer detergent are not provided.) This mission team house is ideal for small teams of eight people or less who may also want more flexibility on dates. Air mattresses can be brought so that it will accommodate more people. Cost: $100 Deposit to reserve; $115.00 per person for a five night stay. Teams staying for five nights will receive a T-shirt and dessert fellowship on Thursday night. No pets are permitted. Teams participating in construction projects are responsible for bringing work tools and materials for their project. Materials may be obtained locally, however, we will need a supply list no later than four (4) weeks prior to your arrival, should something need to be ordered. Also, plan on one (1) person on the team to be able to pick up any other supplies if needed. Please note: There will be a $20.00 fee charged to your team for every trip that GAP makes on your behalf to pick up supplies or transport materials or trash left at the job site. Advanced scout visit is mandatory for all construction teams. This pre-site visit is usually scheduled between February and April. The trip needs to consist of 3-4 people, which includes the construction and project leaders. On this trip the construction site will be visited and the team will be introduced to the family. Measurements and material list will be done at this time. Please call or email to schedule your pre-site visit as soon as possible. Water bottles or other containers to transport drinking water to job sites. The lodge is equipped with a water filtration system. Large buses are not ideal for mountain roads. We recommend small buses, vans, and/or trucks. If you are doing a construction project, bring a truck if at all possible. Donations: Items for distribution can be unloaded on Monday morning in preparation for Tuesday’s distribution. Just as Jesus was a Carpenter, you can be also. Bring your hammers and your nails, it’s time to work hard. Go into the homes of our clients and help do repairs. Jobs include anything from constructing a wheelchair ramp to repairing a bathroom to remodeling an entire home. Above all else, you will be able to share the Gospel to an entire family, and perhaps a community. Advanced scout visit is mandatory for each construction team trip. Low income apartment complexes and trailer parks are the perfect place to teach children about Jesus. You may also choose to combine your construction project and Bible Club by setting up games, crafts, and Bible lessons in the yard. Please note: If you are conducting Kids Clubs at an apartment complex, you will need to distribute fliers and get the word out either upon your arrival Sunday evening or Monday morning. Each team is responsible for promoting their children’s programs. Your team should plan on distributing flyers either the Sunday night or Monday morning of your trip week. Please be in contact with us for specific details. In the summer months, children will often accompany their parents to the distribution center. A craft, snack, game or story can keep them occupied so their caregivers can be ministered to inside. Please understand that the children will be there 15-45 minutes depending on what type of appointment the parents have. The children will come and go all day. Please note: Due to space limitations we use two or three team members at a time. Spend time with those that rarely have visitors. Golden Years Nursing Home has approximately 60 residents. Music, Bible stories, crafts, snacks, and quality time are always appreciated. Your team may choose to visit one day or for a period of time each day. Please note that many of the residents are mentally challenged and any craft must be very simple. Residents also enjoy receiving goodie bags filled with soda, chips, and snack cakes. Minister at our local senior center through music, games, crafts, and fellowship. They really appreciate snacks and being surprised with goodie bags. On Wednesdays you can play Bingo and provide the prizes. 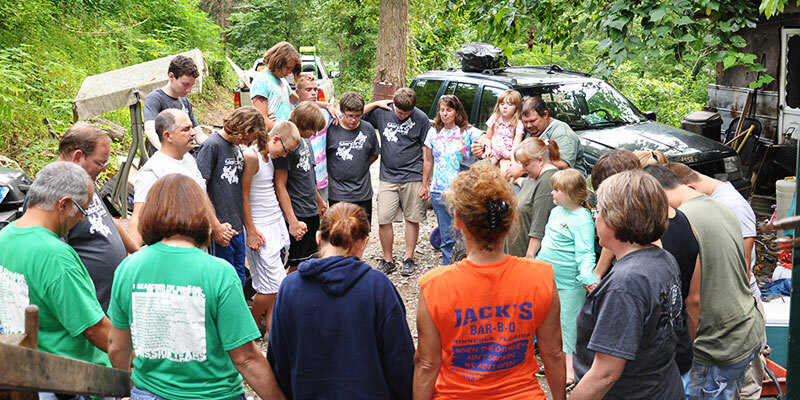 Visit local families and be mutually encouraged as you share your life stories with each other and pray together. Sometimes you will be able to take your whole team, though for the most part this will be an opportunity for just two or three members. Prayer walking is also known as “praying on site with insight”. You will walk around in groups of 2-4 in strategic ministry areas allowing what you see, hear, touch, and even smell direct how you pray. Prayer walking is not a program, a process, nor a prayer event. It is intercession that transforms the intercessor and his/her praying. We believe that God answers prayer and that prayer is one of the most powerful tools of evangelism that God has given us. Those who have participated in prayer walks can share some incredible stories of how God moved before, during, and after their prayer walks. There is something about a shared meal that gets people to open up and talk with each other. That’s the idea behind BeansTalk. We have created a space in our distribution center for the community to relax over a meal and enjoy conversation with each other and the staff. Your team will have the opportunity to prepare a simple meal to share throughout the day. We encourage your team to share any other talents they may have; in the past teams have shared music, crafts, and haircuts, among other things. You can help out during distribution on Tuesdays and/or Thursdays. On these days we distribute resources such as food and personal items to our clients. If you are comfortable with one-on-one interactions, you can help out with re-evaluations and help update client information, pray with clients, and most importantly, share the gospel. Please Note The Following: Due to space, the distribution center can only hold a limited number of volunteers. Lunch: If a meal is being served in BeansTalk distribution volunteers are invited join us there for lunch. Dressing For Distribution: Modest shorts can be worn. Make sure all undergarments are covered at all times. Please make sure any message on your clothing is honoring to Christ. Distribution days are Tuesdays and Thursdays 9:00 AM—3:00 PM. All team members serving during distribution should be at the Distribution Center at 8:30 am for orientation. Plan on working until 4:00 pm. Personal Products: bath soap, shampoo, deodorant, toothpaste, toothbrushes, feminine hygiene, shaving, razors and toilet paper. Cleaning Supplies: dish soap, bleach, multipurpose cleaners and ingredients for laundry detergent (Fels Naptha Bar, Borax, Arm & Hammer Super Washing Soda). Baby Items: Diapers, wipes, bottles, powder, lotion, car seats, and baby furniture. Household Items: Sets of dishes, pots and pans, small appliances, linens, towels, heaters and fans. School supplies: book bags, 3 ring binders, folders, notebook paper, spiral notebooks, pens, markers, 24 pkg crayons, scissors, calculators, glue and rulers. New tennis shoes (all sizes). Clothing: new underwear and socks, any NEW clothing. GAP no longer accepts used clothing! Used clothing presents numerous problems for the staff. Although clients are in need of some specific items we are often operating in excess. GAP does not have the storage space to accommodate any additional clothing other than important items such as socks and underwear. Please allow us to continue serving our clients in meaningful ways by NOT bringing any used clothes.